Pots and pans are the essentials of a kitchen. They are some of the things you should never compromise on. A blender or juicer? You can go for a less expensive brand with less fancy features. A toaster? A cheap one will do. Saucepans? Spend more money and get the best. Good quality saucepans will last for years without any deterioration in quality even with daily use. They can withstand the daily banging and scrubbing that comes with cooking. They also cook your food better. No hot spots that leave your food burnt. In most cases, it’s better to buy saucepans in sets rather than individually. You save more money and you get a variety of sizes and designs to meet all your kitchen needs. In this 10-minute buying guide, we are going to review the best saucepan sets for your kitchen. To pick the best ones from dozens of brands, we looked at various factors including construction quality, non-stick coating, size options and whether they are dishwasher and oven safe. But first, some of the most important features to keep in mind when shopping for saucepan sets. This is the most important feature to look at. Thin walled saucepans, though appealingly cheap, will only disappoint. They do not last long before they start warping and loosing shape. They also cause burning and uneven cooking. It’s totally worth it to spend more on thick sauce pans that cook your food well and last for years. If you have the budget, go for copper pans. They are expensive but are fantastic on the stove. They conduct heat really well and once they get hot, they stay hot. This makes it easy for you to cook your food evenly. Copper pans are usually lined with other materials such as stainless steel to prevent reactivity. 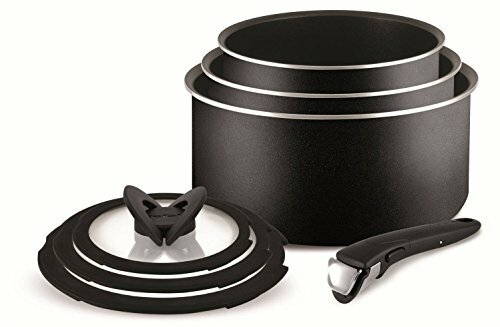 If you are looking for something cheaper, Anodized Aluminium sauce pans are also good. Aluminium pans coated with stainless steel are even better. They last longer and have better conductivity. If you want to be a bit more traditional, buy cast iron sauce pans. They are a bit of work to clean and maintain but they are very durable, versatile (can be used virtually anywhere from the fire pit to the oven) and are great for searing meats. Most saucepans nowadays come with a non-stick coating as standard. It makes cleaning up so much easier. If you’ll be doing a lot of meat searing, I recommend the traditional types of saucepans. Cast iron is especially good. Non-stick saucepans are also not the best for high-heat oven cooking. Make sure you check the temperature limit to avoid toxic fumes. A saucepan set will have several size options. Generally, make sure the set has at least 1 small saucepan for sauces and soups (1-2 litres) a medium size saucepan for everyday cooking (2-3 litres) and one large saucepan for special occasions and foods like mashed potatoes (3L+). The more the number of saucepans in a set the more size options you’ll have. The ideal set will depend on your needs. If you’ve just moved into an apartment or you are overhauling your kitchen, a large set (at least 4 pieces) is best. 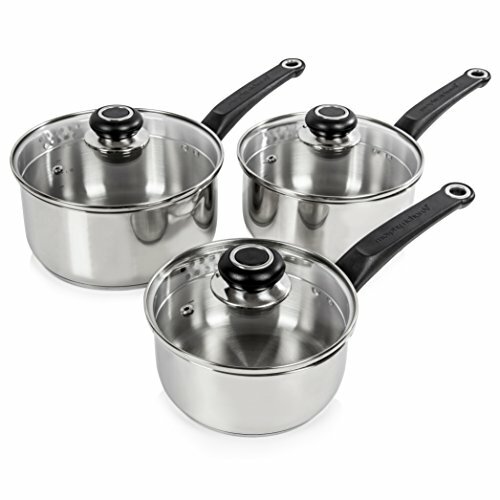 If you are just looking for extra saucepans to complement what you already have, a 2 or 3-piece set is adequate. 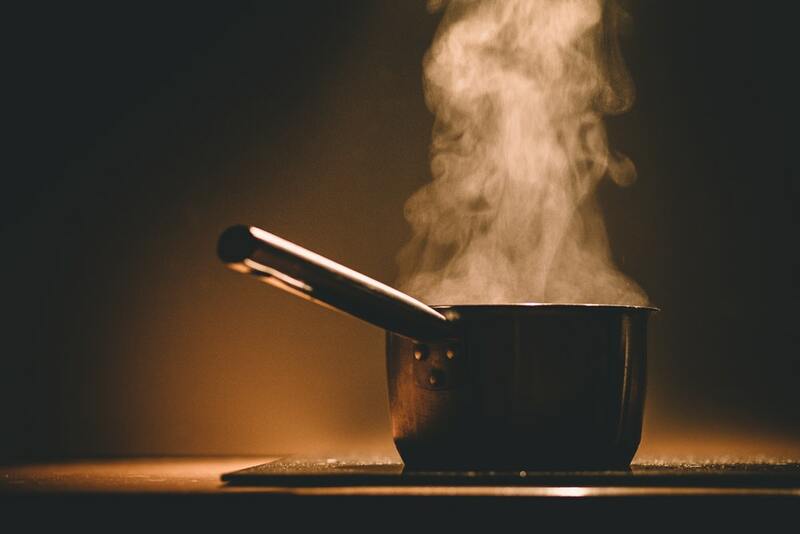 Before you buy, check whether the saucepans are safe for different kinds of stoves including electric, gas and induction. Most are. Also check whether they are oven-safe. Some can be used in the oven but come with temperature limitations. If you’ll be preparing a lot of stove-to-oven recipes, I recommend a cast iron saucepan set. Something most people don’t remember to check – the handle. In a low quality saucepan, the first part to break is usually the handle. It was probably welded or screwed onto the saucepan. It can actually be a safety hazard when you are handling hot foods. The best handles are those that are either riveted to the saucepan or are one with the saucepan (made from the same piece of metal). This particular set comes with 7 pieces but there is an option of a 3, 4, 5 and 13-piece set if 7 are too many or too few for you. The saucepans are made from aluminium which has good thermal conductivity and a lightweight feel. On the inside, they have a durable non-stick coating that is oven-safe up to 260 degrees C. It ensures your food doesn’t stick to the pan and makes cleaning much easier. The saucepans are safe for use on all types of hobs except induction. They are also safe for storing foods in the fridge. One of the best features of these saucepans is a detachable handle. This makes storage easier especially in kitchens with limited space. Handle-less saucepans are also better for use in the oven and fridge. Detachable handle and stackable design for easy storage. Oven, fridge and dishwasher safe. This set is available in 3 options: 2-piece, 3-piece and this 4-piece. 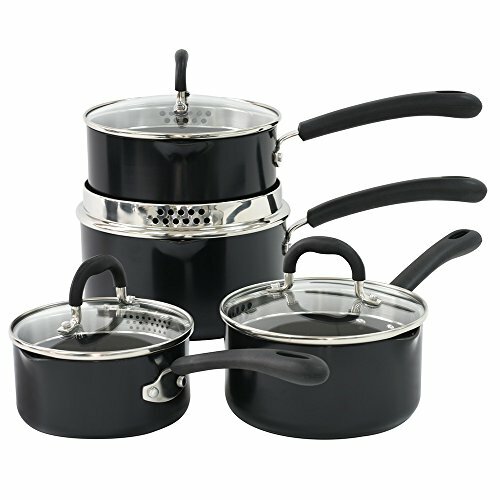 The complete 4-piece set consists of the following saucepan sizes: 1L, 1.6L, 2.3L and 3.1L. That’s enough to cover all your cooking needs from quick sauces to pasta and mashed potatoes. The saucepans are made from thick 3.5mm aluminium which distributes heat evenly for better cooking. The securely attached handle is made from silicone. It stays cool to the touch no matter how long your sauce has been simmering. The handles have a hole at the end for easy hanging. All the saucepans are finished in a durable double-layer non-stick coating on the inside. Washing up after dinner isn’t a problem. You can either wash them with a non-abrasive pad or throw them in the dishwasher. Quality construction – they come with a 10yr guarantee. Hanging loop makes storage easy. Sturdy handle that stays cool. 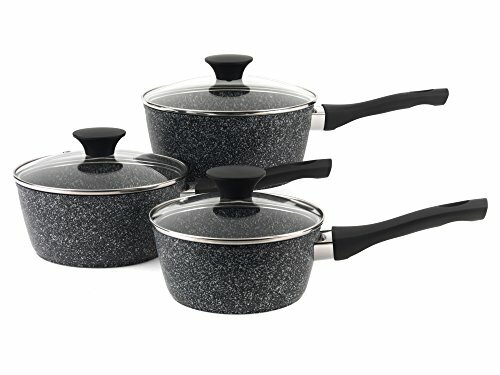 This 4-piece set is a bit pricey but the pans are bigger – 1.3L, 2L, 2.8L and 3.8L. They also have a better quality and more durable construction consisting of an aluminium core coated with two layers of stainless steel. The tri-ply design improves its thermal efficiency and lifespan. 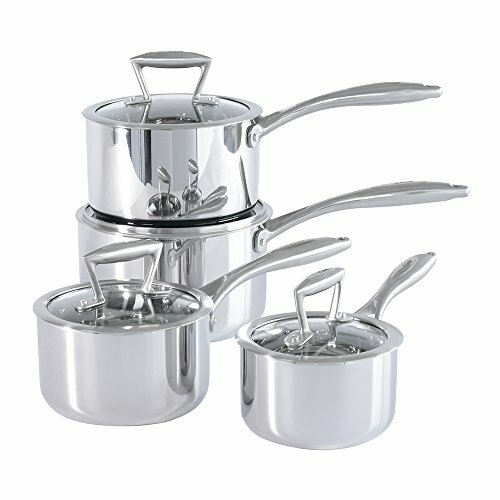 Each saucepan comes with a heavy duty glass lids with stainless steel rims. The handle is also made from stainless steel and riveted securely to the saucepan. The saucepans are safe for use on all kinds of stoves including induction, gas, ceramic, solid-fuel and halogen. They are also safe for the oven up to a temperature of 260 degrees C.
Extremely durable – 25yr guarantee from the manufacturer. Safe for all stoves and the oven. This is a great set if you are looking for something cheaper. Even the 8-piece set costs less than other 3 and 4-piece sets we have reviewed. The pans are made from an aluminium and stainless steel. The combo delivers good thermal performance and durability. The handle and the knob on the lids stay cool to the touch. When you need to pour out a liquid, there are spouts on both sides of the pans to avoid any messes. The lids have built-in drainage holes that allow you to drain water from your vegetables or pasta without transferring them to a colander. The holes also act as steam vents to prevent excessive steam build up when cooking. For the low price tag, there are a couple of sacrifices you have to make. For one, the saucepans are not non-stick. You may have to do some scrubbing after cooking certain foods. Customers also say the handle is a bit problematic. It’s not very sturdy and water tends to get under the handle. But other than that, this is a great set for the price. Durable aluminium and stainless steel construction. Convenient handle design with drainage holes and steam vents. Spouts for pouring out liquids. This is another affordable set though a bit better in quality than the one above from Morphy Richards. For a bit more money, you get non-stick surfaces, sturdier handles and a better looking finish. The pans are made from aluminium which is durable, corrosion-resistant, scratch-resistant and heats evenly. Each saucepan comes with a glass lid. Like the Morphy Richards saucepan lids, these ones also feature steam vents. They release excess steam from the pan without causing heat loss. The pans are safe for all kinds of hobs including induction, gas, electric and halogen.